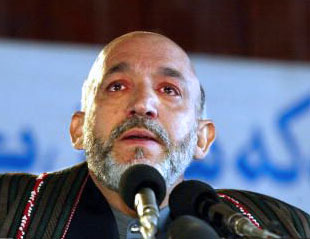 As the New York Times reported, Afghan President Hamid Karzai once again broke down in tears during a televised speech. Addressing a crowd of educators in Kabul, the President sobbed as he lamented the lack of progress in the country and the uncertainty of the future. Just like last time, when he got emotional listening to the stories of victims three years ago, Mr. Karzai will surely receive criticism for this outbreak of emotions. A president, especially one who is at war, is supposed to be strong, bold, and stern they say. He is not to cry, but to act. The realities of Afghanistan, however, are different. And so is its president. At the moment, Mr. Karzai is overtaken with frustration and hopelessness. A dignified and charismatic man of good intentions has struggled to change the living conditions of his people. We only need to dial the clock back a few years to understand how this happened, and why Mr. Karzai is more a victim than an instigator, as Josh Foust put it on his FP blog. A lot seems to have gone wrong for the man who came into this job on the merits of his dignity, and on the basis of his clean image. He was not a warlord, he did not have a militia, and he did not have blood on his hands. And contrary to the popular belief, he was not parachuted from the west. He was a rare breed: homegrown, well-educated, moderate, and relatively clean off the mess the was the Afghan civil war. Above all, he had a history of activism for the sake of reaching an end to the war in Afghanistan. His task at the time? One of the most difficult in world politics. He was mandated to hold together a country of only 30 million people, but as many warring factions. All armed to teeth. He was not only to hold them back from fighting each other, what they had done for the previous two decades, but also to establish a democracy in the country and to rid it from Al Qaeda and extremism. Perhaps, in the wake of recent events, the brother should be plural: brothers. Much of Mr. Karazai’s frustrations lie in the fact that those close to him have betrayed him tremendously, only caring for their own pockets and power and not for the progress of the country. Internationally, his image is hurting bad from the spiraling ill-reputation of his brothers. His last name is becoming a liability. Locally, his young government is struggling to reform. The only answer that he can find to the problem of corruption, which is derailing his legitimacy, is setting up commission after commission. Security has not improved remarkably, and the war does not seem to be reaching an end any time soon. But what pains the President most is that all these factors have led to his people losing faith in him immensely. To his defense, Afghans have been a little thankless at times, mostly forgetting the harshness of the reality and the lack of infrastructure that Mr. Karzai began with. That is not to say that their demand for more is illegitimate. It is just that the demands have not happened with an eye on the dark recent past that country is trying to emerge out of. And lastly, Mr. Karzai is extremely worried about his political legacy. This is his last term as President and he has given a lot to this process of national revival. Yet, things are certainly not where he would want them to be. Because of the factors mentioned above, he has struggled to turn his hopes and dreams for the country into reality. Mr. Karzai knows that Afghan politics are cruel—that he will not be remembered for his intentions and his dreams, but his actions which have been impeded by the difficulty of the situation. This, above all, frustrates the President. For the moment, however, spare a thought for the man. His job is one of the world’s most difficult and his struggle must go on. Was it a question of character or circumstance? This entry was posted on Wednesday, September 29th, 2010 at 2:31 pm	and tagged with Afghanistan, Hamid Karzai, Hamid Karzai in Tears, Kabul, Karzai Cries, Mahmood Karzai, New York Times, Refugee, United States and posted in News and Politics. You can follow any responses to this entry through the RSS 2.0 feed. only a dumbass would take this job. it will do nothing to you but drvie you Karazy!